Bellagio, a small town in Italy, sits on a promontory on Lake Como where the lake splits into two southern branches. It’s a fabulous setting but definitely not what I expected. The hills are bigger, it’s very lush and there are far more towns and villages around Lake Como than I ever anticipated. Bellagio is a very popular tourist destination – but it’s not for everyone. Mostly I saw romantically inclined couples and young families but there wasn’t a backpacker in sight, perhaps because of the lack of hostels. There’s enough to keep you busy for a few days and I think that’s probably enough time for most people. Here are 7 things you can do in Bellagio, Italy. Take a boat tour of Lake Como. 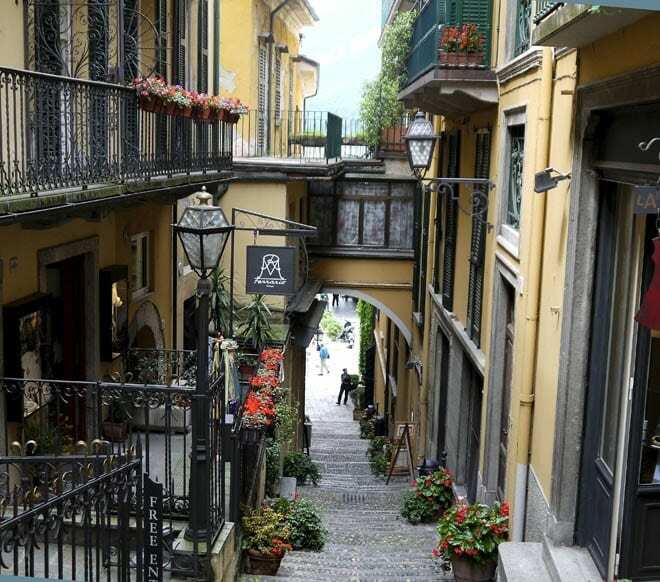 Have lunch or dinner in another town on Lake Como. The cafe culture is alive and well in Bellagio. Wander the back alleys of Bellagio. Enjoy window shopping as you wander the back alleys. There are some superb clothing, jewelry, wine and art stores that will tempt you – and that’s coming from a non-shopper. Head to the waterfront and hit the promenade. Find a bench and watch the world go by while enjoying the views of Lake Como. Visit the Gardens of Villa Melzi. For only 8 Euros (2019 prices) you can spend an enjoyable hour meandering the garden designed by architect, Luigi Canonica, and Luigi Villoresi. The paths take you along the lake and then up the short hill with a view to the towns on the far shores. You can rent private boats but an inexpensive option is to get a day’s pass for 14 Euros. This will allow you to jump on and off at a variety of towns on Lake Como – including Menaggio, Varenna, Lenno, Tremezzo and Cadenabbia. You do need to pay attention to what type of boat you get on – the fast ones (which are more expensive on a one off ticket basis) or the slow ones which basically do the milk run stopping at every town along the way. Also check the schedule so you aren’t waiting around on a dock for a few hours. Hp on a boat and head over to Varenna or Menaggio, popular options to explore, dine and then hop back on the boat again. It’s a fun way to experience Lake Como. Find a table at one of the many lakeside cafes and have a mid-morning coffee. Or perhaps a gelato in the afternoon. People watching and checking out the activity on Lake Como is an enjoyable way of spending a few hours. If you’re more adventurous then try a swim in Lake Como (though not for me with the amount of boat traffic and the look of the water), rent a windsurfer or paddle a canoe. Bellagio is accessible by car but if you don’t have one then try a boat ride from Como or a combination of a bus ride from Como to Menaggio and then over to Bellagio by boat. If you’re looking for more adventures in a drop-dead beautiful landscape check out Laurel’s post on hiking the Cinque Terre in Italy. Phenomenal pics, just need someone to go check it out with. Bellagio is definitely not the place for singles. It also seems to be a bit of a honeymoon destination. Wow, Bellagio looks like our kind of place- relaxed, green, and authentic. @Mary – You’ll find excellent food too – and of course gelato. We ended our honeymoon trip through Italy in Bellagio. Was a great drive in (and out to Milan) around Lake Comp. The town was tiny and beautiful, with some fun walks and friendly people. And tasty gelato. We got a room facing the lake, and watching a storm roll in over the water was awesome. I’d definitely second your recommendation as a great stop on anyone’s Italian tour. @WAF You can’t beat a gelato with a view in Bellagio. We saw a storm one night-and what beautiful skies building up to it. What a great note to end your honeymoon. Love Bellagio and Lake Como! Nice list! I could spend weeks on end here! @Laura No George Clooney in sight when I visited but still a very beautiful place to visit – and shop. What a wonderful tour around Lake Como! Have never seen Italy’s Lake District but next week, I will have the opportunity the visit Como’s sister, Lake Garda! Thanks for all of these fine tips!! @Jeff You should be in for a treat and what a great time of year too for a visit. One of our favorite things in the town of Como was visiting the opera. The theater is really beautiful- it’s one of those old European theaters with the ornate boxes- and the performers were excellent since this town is very close to Milan. We also loved going up the funicular railway from Como, and hiking up to the small town at the top- the home town of Volta I believe. Also there was an amazing pizza place at the top of the funicular railway with a view over the whole lake- it is set up for tourists with a menu in many languages, but the food was great and the view is to die for.